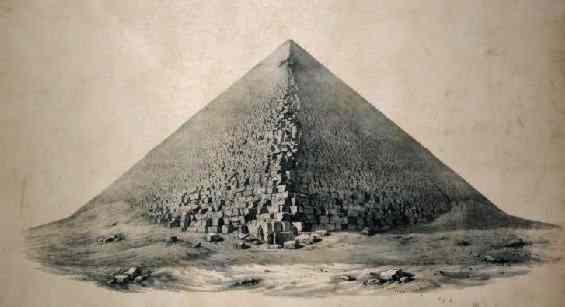 People of the 19th century spent many hours tapping the stones of the pyramid in what was mostly an unsuccessful search for hidden chambers. Hollow sounds were found when tapping the roof of the King's chamber, and dynamite was brought in with dreams of treasure. Fortunately they did not blast through the roof of the King's chamber, instead they tunneled from the grand gallery. A small hole can be seen, far up the south wall. They found a low, unfinised chamber above the King's, with the same floor size. This dusty room is now called Davidson's chamber, named for a man who lived in there for a while, constantly worried about someone moving his ladder. The tapping and blasting continued upward until a total of five chambers were found, all empty. Collectively they are called relieving chambers, although their purpose is not known. Rumors of further digging in the area circulated around the start of the 21st century. The stones of the relieving chambers were left unfinished by the pyramid builders. On these stones were found marks in red paint identifying the crew that cut the stone from the quarry. Many of these marks include the cartouche of Cheops, the only direct tie between him and the Great Pyramid. 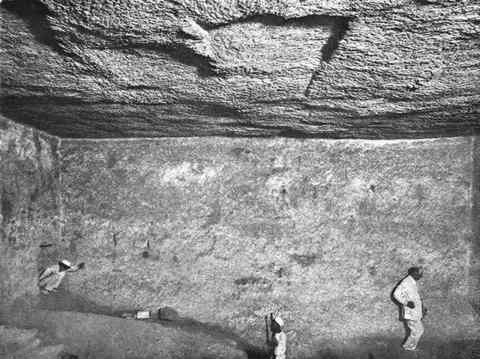 Some suspect the marks are modern counterfeits, however the stones removed from Cheops' boat pit showed similar marks. Quarry marks copied by Perring Andrews. There are other hidden chambers and passages in the Great Pyramid, the way to them blocked not by ancient stone but by locked iron doors. One is the mysterious well. At the sides of the lowest point of the Grand Gallery were two stones about two feet (half meter) on each side. Unknown to the Pharaoh, one of those stones hid a tunnel, the probable route of those who stole away all the riches so carefully placed in the Pyramid. It was an inside job. The first portion of the tunnel, through the pyramid itself, was walled with dressed stone and appears to have been built along with the rest of the pyramid - meaning that the architects were involved in the tunnel and most probably the theft. Below ground level they found a small natural cave in the limestone, probably originally filled with gravel, as most caves of Giza are. This becane a rough chamber known as the Grotto. The tunnel continued down until eventually meeting the Descending Passage, at a point much lower than would be thought to be needed. The entrance to the Pyramid stood open for a considerable length of time in antiquity, perhaps beginning soon after the Old Kingdom. Ancient Greeks and Romans write about their visit inside the Pyramid where they saw the pit, but make no mention of the well or the ascending passage. The sands of the centuries filled the passage. They covered the original entrance, or it was closed and lost. When al-Mamum broke into the Pyramid in the 9th century AD, he explored what was open to him of the Descending Passage and he did not discover the lower opening of the well. The lower portion of the Descending Passage was blocked by sand even then. One can imagine a small group of men, thieves, hiding in the Grotto, quietly, as the elaborate funeral procession of the Pharaoh passed overhead. Maybe some of the heavy clouds of incense penetrated to their dark chamber, along with the strange wailing song of the chantresses and the bone chilling sound of their sistrum rattles. Finally, after endless hours, the mechanism holding the giant granite plugs was released and three crashes shook the Pyramid as the plugs shot home, sealing the tomb for all eternity. Sealing these men inside, too, if their plan failed in any of countless ways. Somehow, it seems, the robbers managed to take every single moveable object belonging to Pharaoh Cheops out through that tunnel - even the body of the Pharaoh was missing when al-Mamum forced his way around the granite plugs and entered the King's Chamber. After visiting the several chambers of the Pyramid we resolved to go down the well, an irregular hole cut into the body of the Pyramid, beginning near the passage to the Queen's chamber. The total descent from the mouth of the well is 155 feet (47 meters); two of the portions are perpendicular, while the third has a very rapid inclination. With Arabs lighting the way with torches and muttering incantations to drive away the demons, I let myself down this tunnel, pressing my back against the side, stretching out my hands to steady myself, and feeling with my dangling foot for the narrow, small, worn niches that scarcely give a resting place to the ball of the toe. At length I reached the bottom, and, after looking about and pausing awhile in the gloomy depth, we made our way up a very long passage to the entrance. We catch the light of day and go gladly forth, tired, dusty, dirty; faces covered with perspiration from the heat, and blackened by the smoke of torches. We looked as I have seen men look in battle. 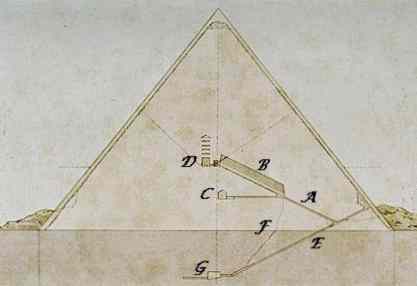 Giovanni Belzoni, to see if it were possible, had entered the Great Pyramid without a light and felt his way through the passages to the sarcophagus in its center and back again, a feat quite impressive and an indicator of his nature. We explored the giant monument by candlelight, that being difficult enough. After we visited the King's Chamber and that of the Queen, we retraced our steps to the descending passage, which continues downwards towards the base of the Pyramid. In the year before my visit, an Italian gentleman by the name of Giovanni Caviglia, a captain of a merchant vessel sailing under British colors, arrived at Cairo. Captain Caviglia hired men to clear away the accumulated stones and rubbish to make this part of the Pyramid more easily accessible to visitors. A great quantity of stones, dirt, and sand had formed in this angle, as the declivity of the passage propels every thing towards it, and the north wind continually blows into the entrance of the Pyramid the sand from the desert which gradually finds its way to this spot. The workmen continued to remove the rubbish, and by degrees discovered that they had entered a passage continuing the descent, which they cleared for two hundred feet (60 meters) more. They carried away vast quantities of stones and sand, and a vast heap accumulated on the outside of the Pyramid. After many days hard work the rubbish was discovered to be falling from above, and to Caviglia's astonishment and delight proved to be coming from the outlet and bottom of the mysterious well which had baffled all preceding explorers. In the course of last year, Caviglia had attempted to dig to the bottom of this celebrated well, a rough irregular tunnel that descends from the foot of the grand gallery, which has drawn forth so many conjectures from antiquaries. However the want of air extinguished the candles and endangered the workmen which compelled him to give up the undertaking. Without some kind of mining ventilation it is difficult to imagine how this passage could be cut into the solid rock in ancient times. The debris had collected for many centuries from various causes, among others the custom of travelers throwing down stones, (some claim they heard them fall into water). 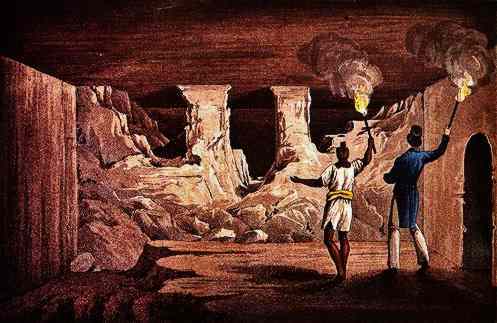 Belzoni, Mr. Henry Salt and many Arabs and visitors had been both up and down the well, there being small holes cut for the feet and hands. Belzoni, who is not so stout as myself, had had great difficulty in squeezing himself through certain parts of it so I missed this part of the Pyramid. After Captain Caviglia had found the lower extent of the well, he continued to clear the passage, and further ascertained that it continued sloping downwards another thirty feet, became horizontally directed towards the center of the Pyramid, and led at last into a chamber cut into the rock. The lower end of the Well is seen at upper right. A horizontal shaft continues from the Pit chamber 33 feet. A shaft of similar length is dug into the floor. Both end abruptly. 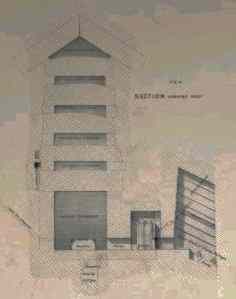 This chamber, called generally the "Pit", is sixty six feet long, twenty seven feet wide, and eight feet high (20 X 6 X 2 1/2 meters) (sources vary on these numbers). It is only half finished. The walls are flattened with square corners on the eastern side. On the western end the excavation has only begun, leaving a sort of platform with two coarse hewn pillars supporting the roof. Two or three rough steps lead between these pillars by a narrow passage to the farthest end, amidst a mass of uncleared rock. Perhaps the designers were in search of the level of the Nile. 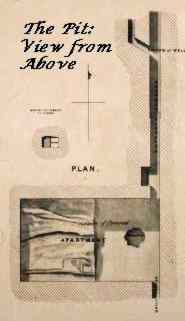 (left) Plan by E.J. Andrews, 1842. We now returned along the horizontal passage with similar difficulty to that we had encountered on entering, but in the ascending passage our difficulties increased. The Arabs in front of us loosened large stones as they climbed. In our descent these had only bruised our back and legs, but now our faces and heads were exposed to them. I avoided some awkward blows reserved for Belzoni, who was behind me and liable every instant to some severe hurt. The little glimmering of light which appeared through the entrance into the Pyramid, by the distance contracted into a very small hole, made me almost despair of reaching it, and I was so exhausted that I threw the candle away, requiring both hands to assist me in my advance. We rested for some minutes at the angle of the two passages, and were much refreshed by some water brought to us by the Arabs. After recovering a little from our fatigue, we ascended the remainder of the passage, and reached the outside of the Pyramid, more completely worn out than can be described. At last we mounted our donkeys, distributed some piastre coins among the Arabs who had assisted us, and turned towards Cairo, my mind being as much delighted as my body was fatigued with the excursion. Excerpt from the Journal of Lt-Col George Fitzclarence, published in 1819. 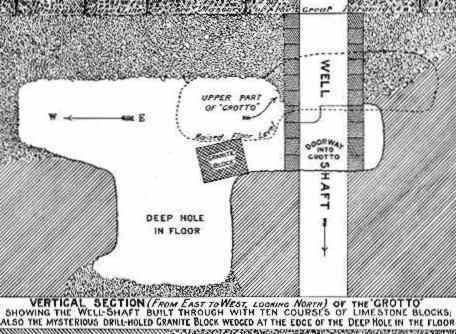 Geologist Robert M. Schoch has proposed the interesting theory that the rough-cut chamber below the Great Pyramid (the "Pit") is an earlier sacred site, and that the Pyramid was deliberately built above it. This would explain the chamber's apparently unfinished state. 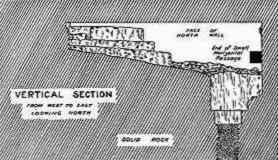 Yet the (only known) passageway connecting to it from the superstructure of the Pyramid, 200 feet (60 meters) of angled tunnel cut into natural rock, deviates only 1/4 inch (.4 cm) from perfectly straight. (Petrie) This extreme precision is similar to that found in numerous instances in the Great Pyramid, and would argue that the Pit, or at least the entrance to it, was built at the same time and was intentionally left unfinished for symbolic reasons. It is most curious, considering the near perfection of the remainder of the building. Of course, the question most exciting visitors for the last four thousand years has been "Where is Cheops' stuff?" Pharaohs before and after Cheops were buried with many big rooms filled with treasures. None of the 4th Dynasty pyramids have these rooms, at least that we know about. 13 acres of solid stone has many places to hide. Perhaps Herodotus' "vaults of the hill upon which the Pyramids are erected." will soon yield their secrets to ground penetrating radar. Interior of the Great Pyramid of Cheops. (A.) The Ascending Passage. (B.) The Grand Gallery. (C.) The Queen's Chamber. (D.) The King's Chamber. (The relieving chambers are above it) (E.) The Descending Passage. (F.) The Well, a tunnel dug between the ascending and descending passages. (G.) The Pit. Engraving by Prisse d'Avennes, 1878. The Greatest Mystery of All.